🤔Should I use emojis in my marketing strategy? First of all, there is a difference that we must clarify: an emoji is not an emoticon. An emoticon is the merger between an emotion and an icon. For example, the best-known emoticon is the smiley face: -) or the equivalent in Japan and China (● ^. ^ ●). The first recorded use of an emoticon is attributed to Scott Fahlman, who suggested the sequence of these characters : -) to indicate that the messages should not to be taken seriously in the electronic panel where he exchanged messages. However, the emojis are small images (12 * 12 pixels) that can interprete a emotion 😊 or an object 🚀. The use of emojis gained prominence in messaging platforms and, each year, more people use them as an alternative to text messages. 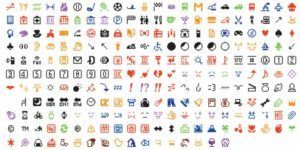 In 1999, Shigetaka Kurita designed the first emoji for I-Mode of DoCoMo, the company where he worked. The result was 176 images of 12 x 12 pixels in black and white, which became the base to follow all the emojis thereafter. Now a day, there are 1,800 emojis which are used by 90% of the online population and they are an essential part of the non-verbal communication for instant messaging. The complexity of human communication has made the introduction of more emojis and gifs in the online conversations necessary . According to many universities, including Cambridge and Michigan, they are agree on the use of emojis influences positively human interaction because they added non-verbal information to the message and they are able to replace facial expressions or the body language that we use in face to face communication. In fact, the communication with emojis had became something to study and, also, a cultural and social claim for some issues. The University of Michigan revealed that the most used emojis are those closest to real words meanings because they are good substitutes for the text. In addition, most used emojis serve to show emotions. 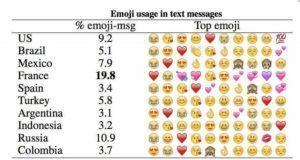 Globally, the most used emojis are: 😂, ❤, 😘, and 😍. The investigation also indicates that the French are those who use more emoticons, with a presence that reaches almost 20% of messages. A curious fact obtained through the analysis of the use of emojis, in thousands of twits, is that they may be an indicator of certain social behaviors. 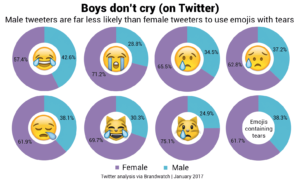 For example, in Twitter, boys don’t cry as often as girls (and it seems to quite match the reality). Another study revealed that there is a strong relationship between emojis use and the power in social networks. The influencer with more social power are, also, who use emojis more frequently online. As cultures symbolisms, we have the paella representing Spain 🍲, the burrito representing Mexico 🌮, the baguette for France 🥖 or the spaghetti for Italy 🍝 and, each year, we added more emojis which are able to represent much more than a simple plate of food. The most surprising fact is the use of emojis as a element of social awareness. Jane Gardner defended that it is a great tool to educate people about social taboos, like the women menstruation, because mixing controversial topics with a lightweight language may make more natural to talk about some questions in daily life. The Durex Company requested a condom emoji to raise awareness about the use of contraceptives methods and prevent diseases. But it is not the only one which has incorporated in their marketing strategies the use of emojis; IKEA, Coca Cola and General Electrics have designed a table of emojis to the enjoyment of their customers and it have shown that its use helps to empathize with their customers and also make the brand more sensible to their target. A recommendation from Livebeep: beware of the cultural connotations. (for example) This emoji 🙇 is understood sometimes as a gesture of someone thoughtful or passing through a time of oppression, but it is not more than a Japanese bow showing respect!!! !